I have searched for over two years for comfortable brogues that I wanted. Considering almost every brand seems to have a pair now, it’s incredible it took me so long. Many are simply too narrow for me, others too heavy, but these shiny, black beauties are just the ticket. They are extra wide and have a soothing insole with a pleasing amount of bounce. With this outfit I wanted to embrace the mannish look but still feel feminine. That is what these brogues do. They are reassuringly glossy (and I will try and keep them that way, for once) but their main appeal was the pair of taffeta laces that came with them. 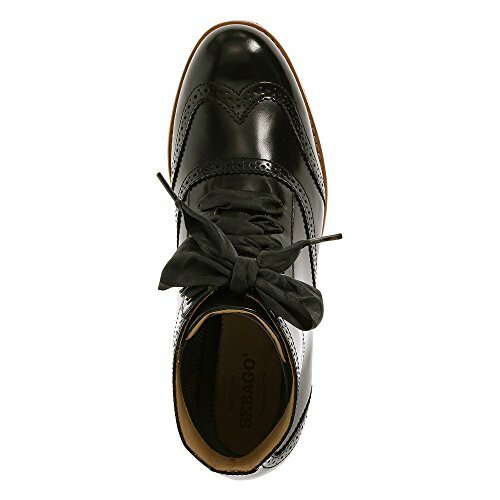 It means you can do an arty little bow when they are laced up and the width of the laces softens the masculinity of the shoe. Socks or tights are great if you are wearing them with a skirt but I find it’s best flash an ankle, like a naughty Victorian, with jeans or slim trousers. The Sebago brand tends to offer boat shoes (a Princess Kate favourite) and the like, but I will be keeping my eyes peeled for more gems like this. Shirt as before, jeans by Gap (www.gap.co.uk), shoes by Sebago (www.sebago.com/uk), hat by Bailey (www.baileyhats.com), bracelet Marni for H&M (www.hm.com/gb).